Barcelona had been calling us back ever since we had a short visit there a couple of years ago. 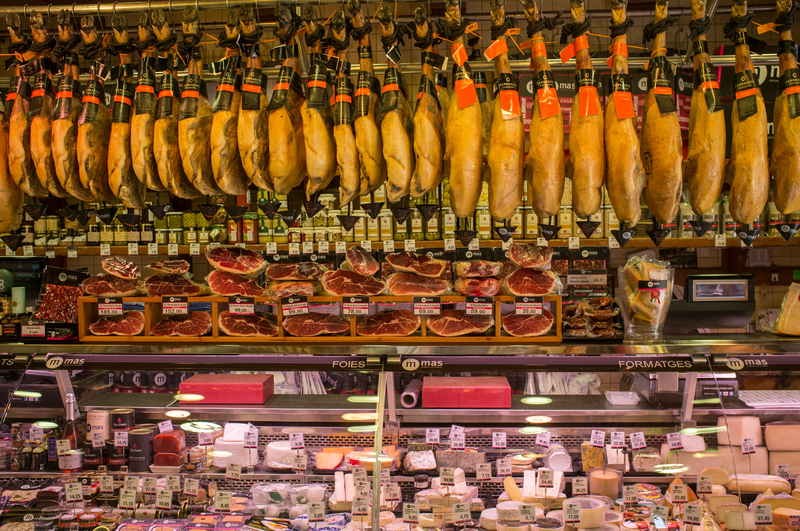 Spanish hams grace this Barcelona shop. 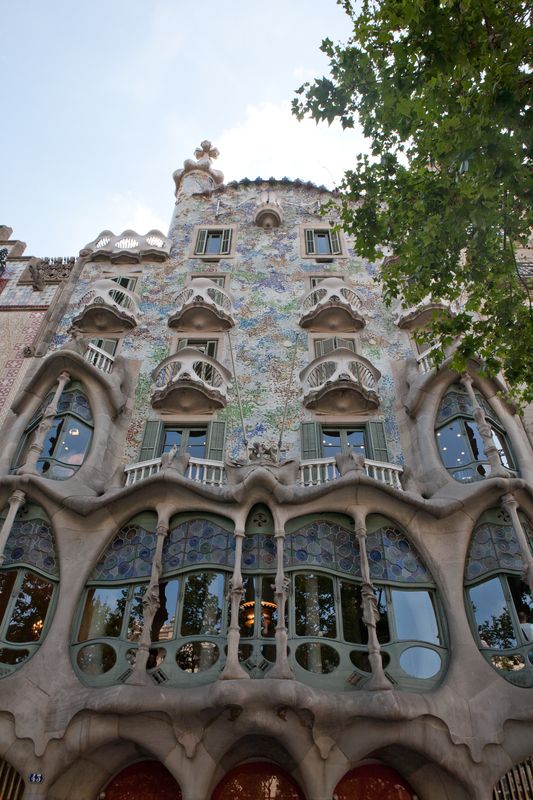 The remarkable works of architect Antoni Gaudi are all over Barcelona. 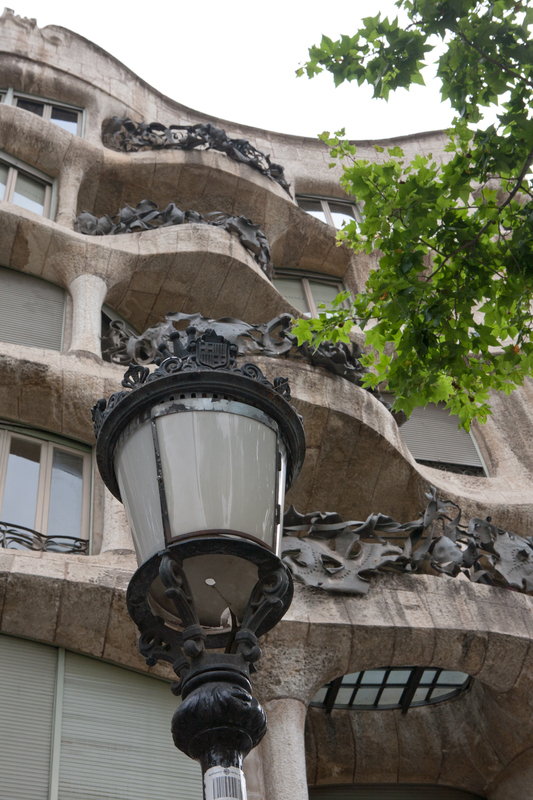 Gaudi masterpieces in Barcelona are found in just about every neighborhood. 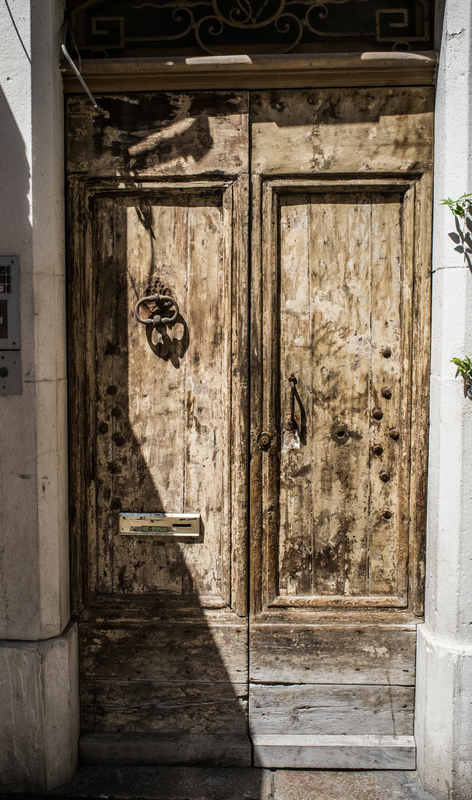 This time we rented an apartment through VRBO in the Grácia neighborhood and settled-in for 10 days of exploration. Grácia, by the way, is in a great central location, vibrant and away from most of the tourist hubbub. 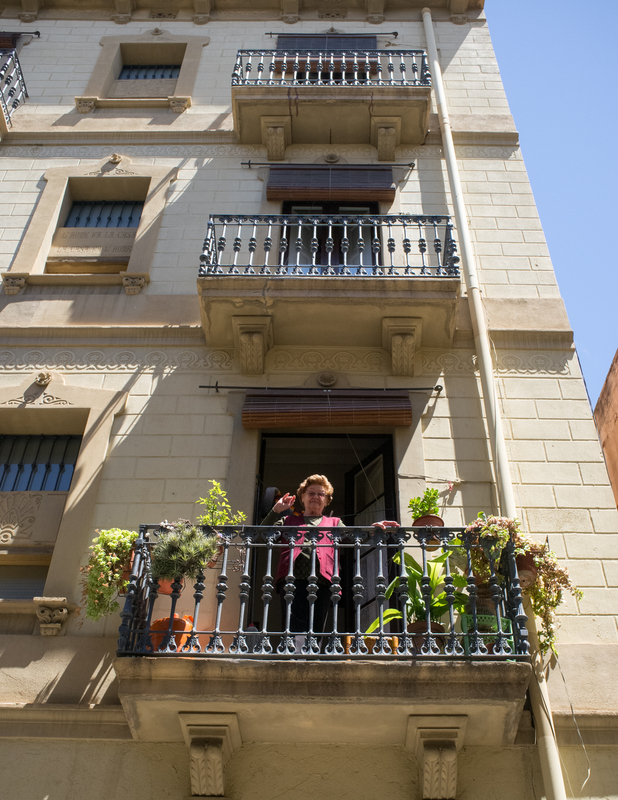 Our hosts, Joan and his wife Elisabeth could not have been more helpful, with lists of recommended restaurants and a local viewpoint of places to visit. A typical square in Barcelona’s Grácia neighborhood. Friendly folks in Barcelona’s Grácia neighborhood. Roll-up doors, not buildings, seem to rule the graffiti artists’ choice of canvases. 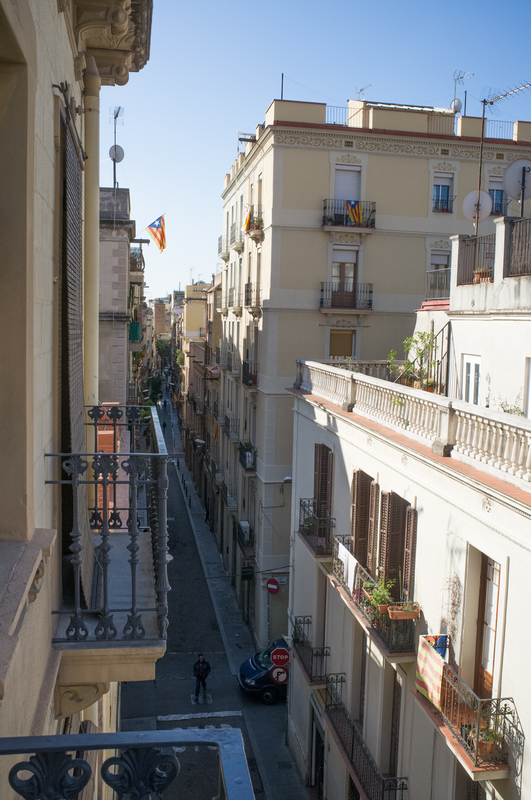 The narrow and vibrant streets of Barcelona’s Gracia neighborhood. Additionally, the Barcelona Tourism office in the Passatge de la Concepció is great source for maps and brochures and the staff is very cordial. There are other satellite tourism offices around the city and they have well-marked signage. Look into buying The Barcelona Card, which has multiple benefits like public transportation and many discounts. This is a new trend with many cities, as we will discuss later in the Amsterdam portion of the journey. Public bicycles abound in Barcelona. 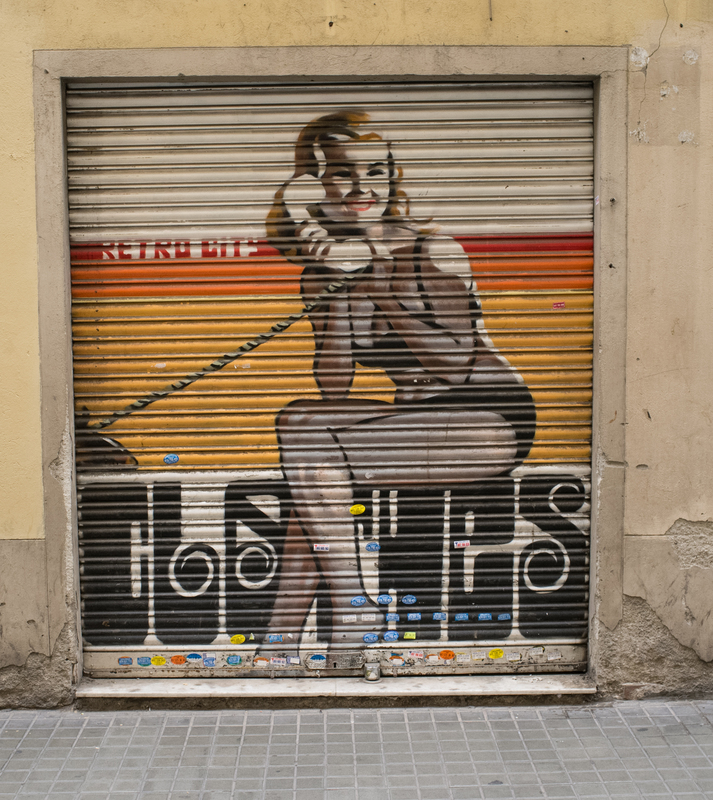 Public art is everywhere in Barcelona. On our previous visit we found the Bus Turístic to be a great value. 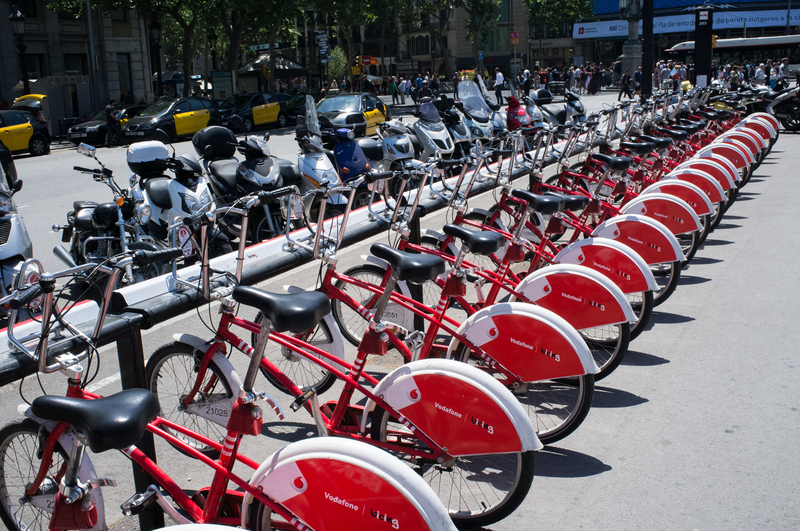 For the price of a 24-hour ticket, you can ride around, getting on and off all day and get a great feel for the layout of Barcelona and how you want to plan your daily outings. It is a genuine good deal and their map is a good one, too. Most stops are staffed and tickets can be purchased quickly. Barcelona’s clean, efficient subway and bus system are also excellent ways to get around after a good overview, and you can purchase multiple-ride tickets that save time at the fare machines. Note: Be sure to bring a credit card with a chip in it. The U.S. has been a slow adopter of these, but they are slowly being issued at last. Ask your credit card company for one if you don’t have one. It will make your transactions easier all over Europe. 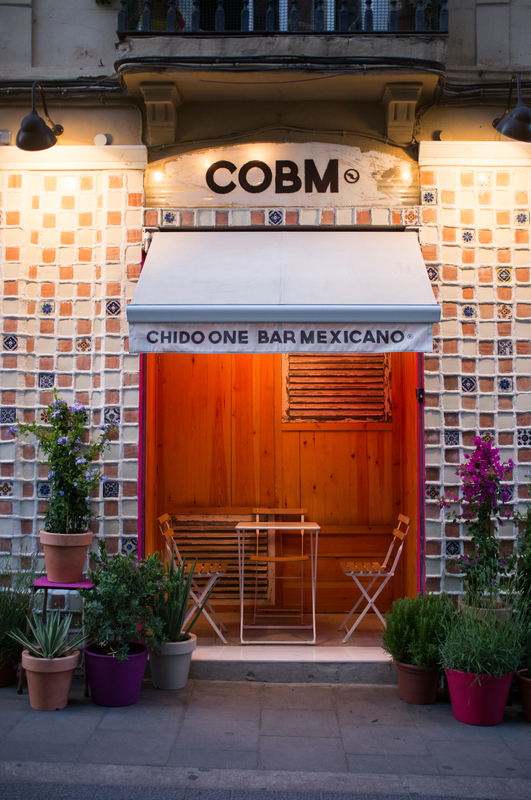 One of a many inviting establishments in Barcelona. So, you have your maps, your Metro tickets and a good sense of Barcelona’s layout. Let’s talk about some adventure options. Remember, most of these places have websites so do a little research on times, locations and transportation before you venture out. It will help. 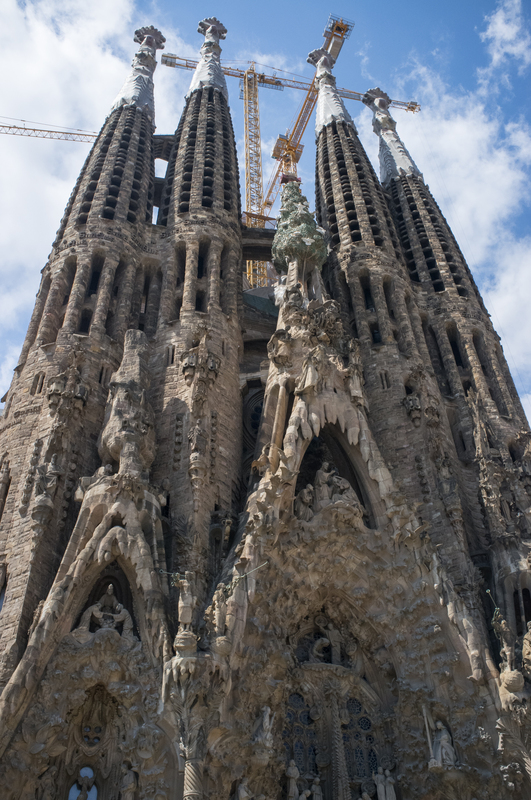 Also take some time to review some of Barcelona’s history and that of Catalunya. 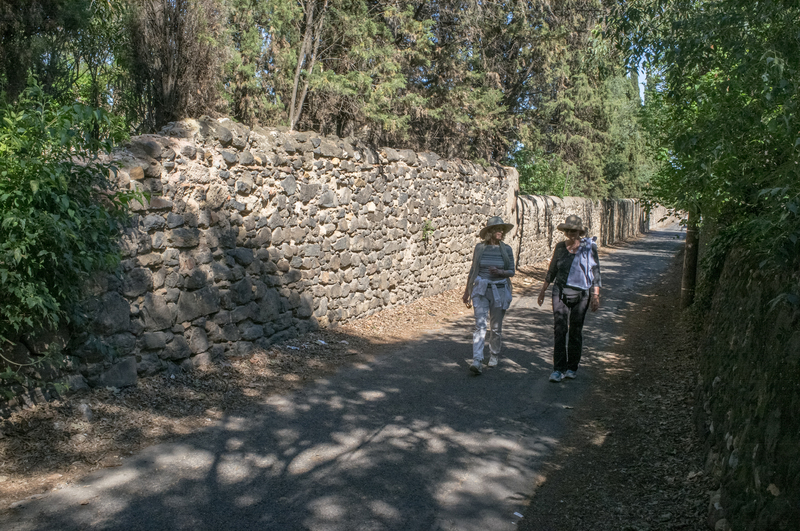 This will lead to a greater understanding of how the city’s shape evolved, fortifications giving way to neighborhoods and the politics and rivalries within Spain herself that live on today. 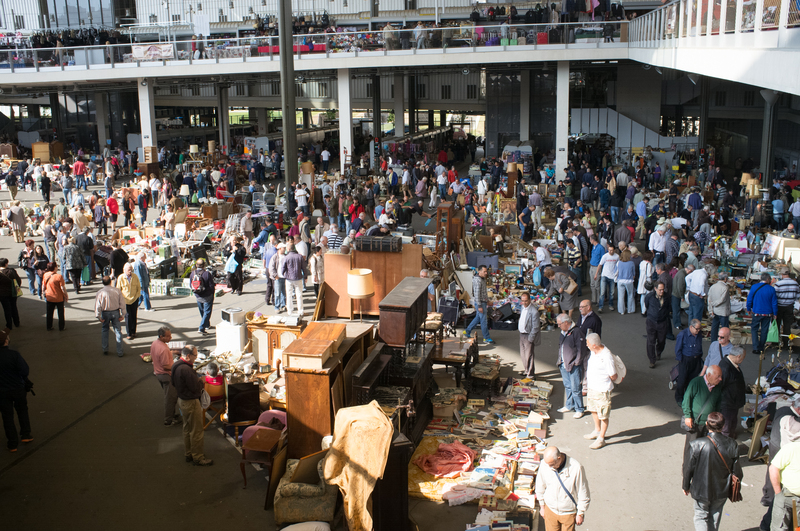 Huge, multi-storied flea market, rumored to be the largest in Europe. 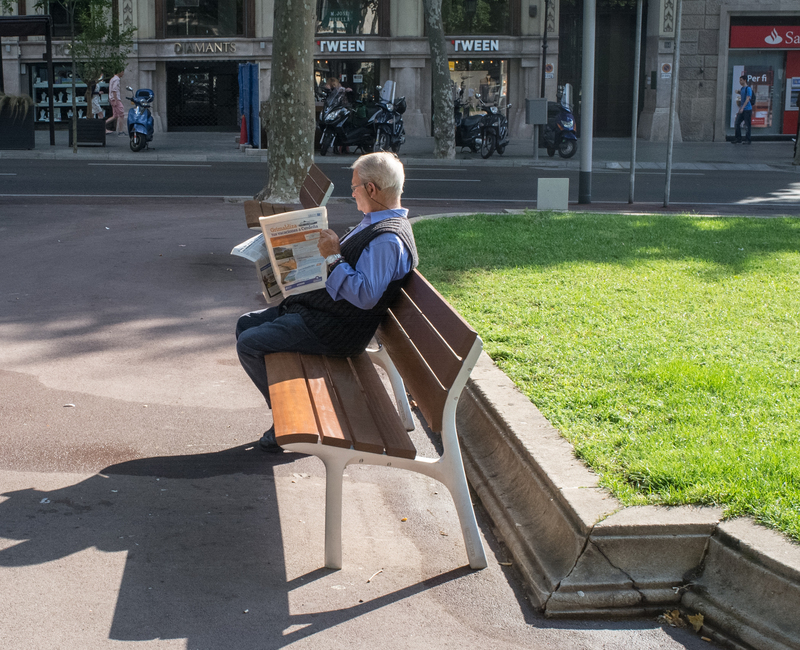 Catching up on the news in Barcelona’s morning sun. 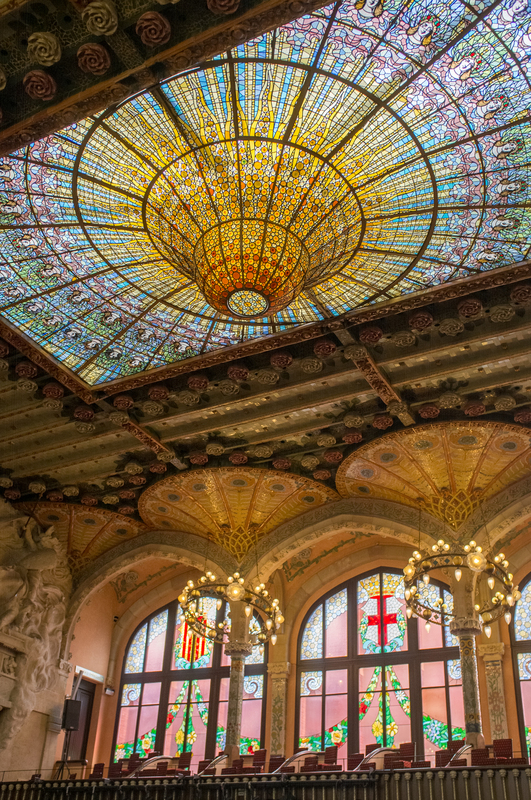 Because some of Barcelona’s key sites can be close together, plan a day such that you are not ping-ponging from one side of town to the other. 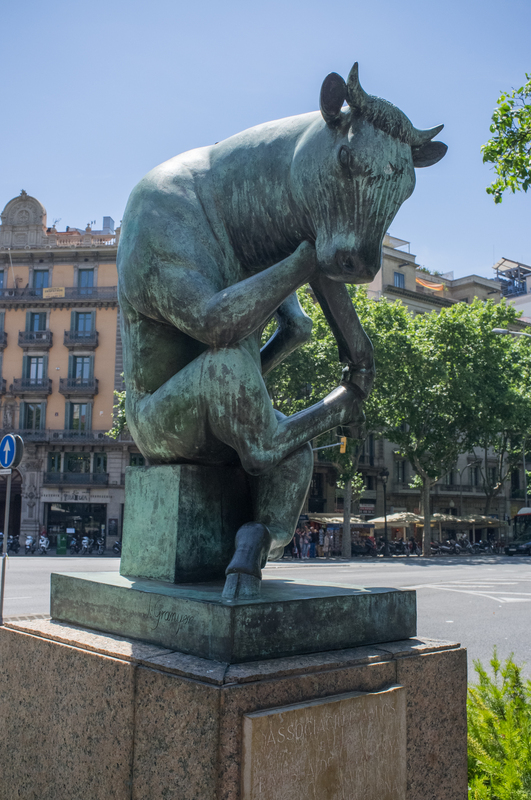 A good example is an early visit to the Picasso Museum on Carrer de Moncada, followed by a stroll down to the nearby 14th-century Basilica of Santa Maria Del Mar. The Picasso Museum is remarkable for its breadth of coverage of the artist’s life. We were moved by his early work as a portrait artist, a trade of the time, before his better-known avant-garde work inspired by his move to Paris. The Basilica of Santa Maria del Mar sits near the harbor area. 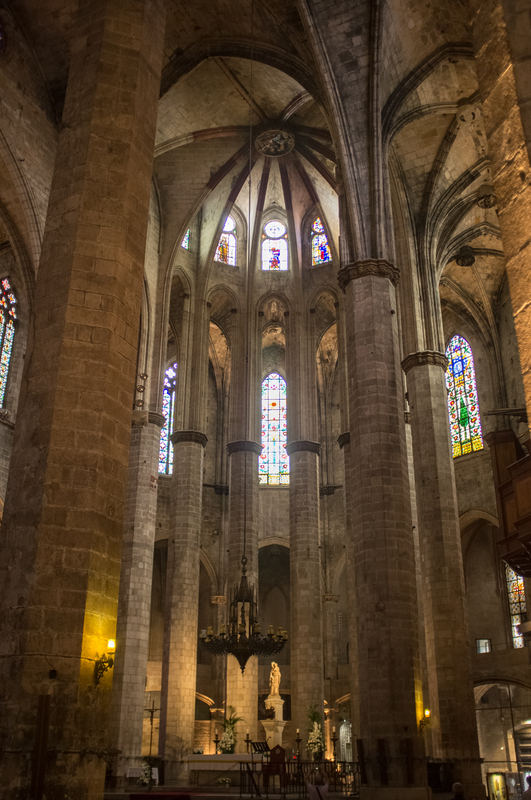 The Basilica of Santa Maria Del Mar can best be enjoyed sitting quietly in a nave or a pew and contemplating the soaring stone arches and intricate sun-lit stained glass windows. 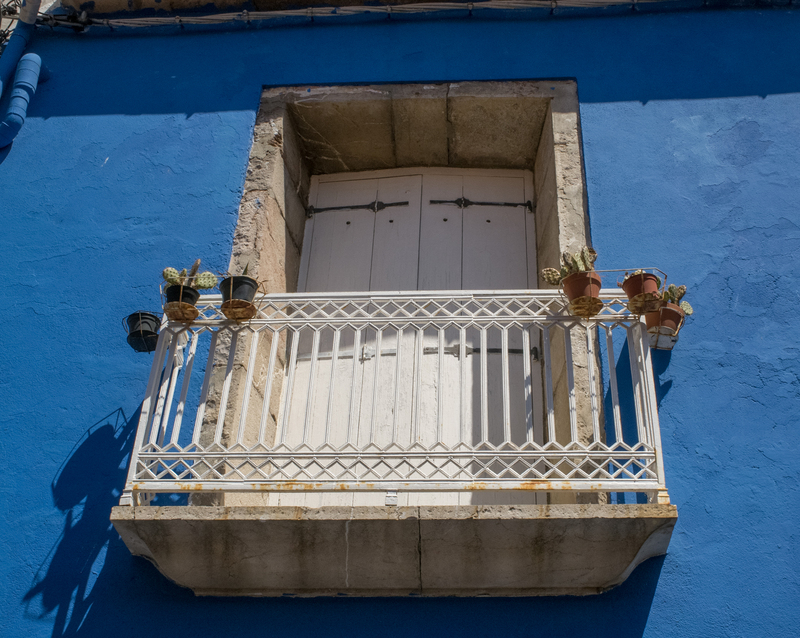 So now that your morning has been filled with art and antiquity, what about lunch and a siesta? 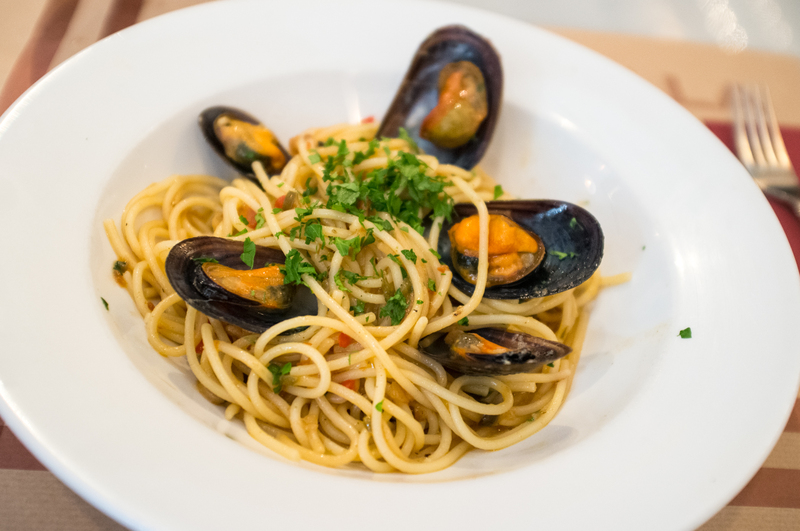 While it might seem touristy, we’ve found the outdoor restaurants right around the Basilica of Santa Maria Del Mar to be perfectly decent and fairly priced. Of these we liked the Santa Maria del Mar Cafe. Great octopus! It would be only fair, of course, to mention one of our favorite lunch spots, however, a bus/subway/taxi ride back to Grácia. And we mention taxi ride here because you’ve been walking and taking in alot. 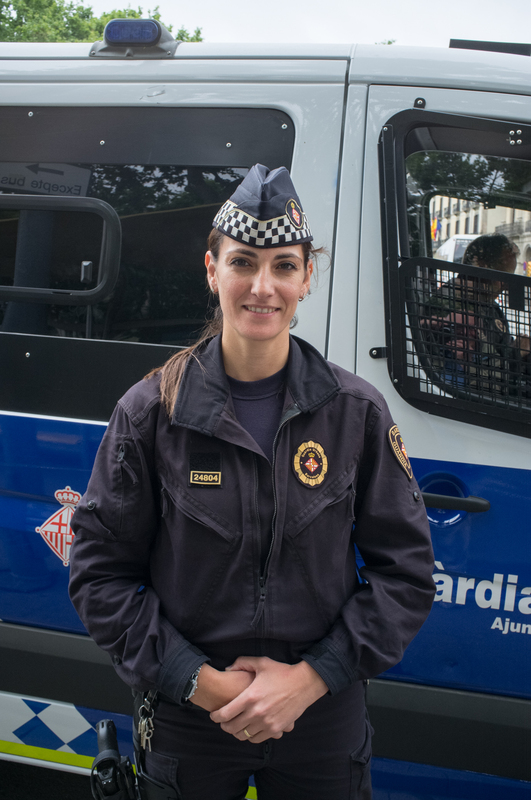 Taxis in Barcelona are very reasonable, regulated and safe. Take the Metro or bus to the station Grácia and walk, or tell the taxi driver to take you to La Pubilla restaurant on the Plaça de La Libertat, next to the large market. We recommend making a reservation the day before, but we’ve stumbled in without one and were accommodated at the bar by the door. 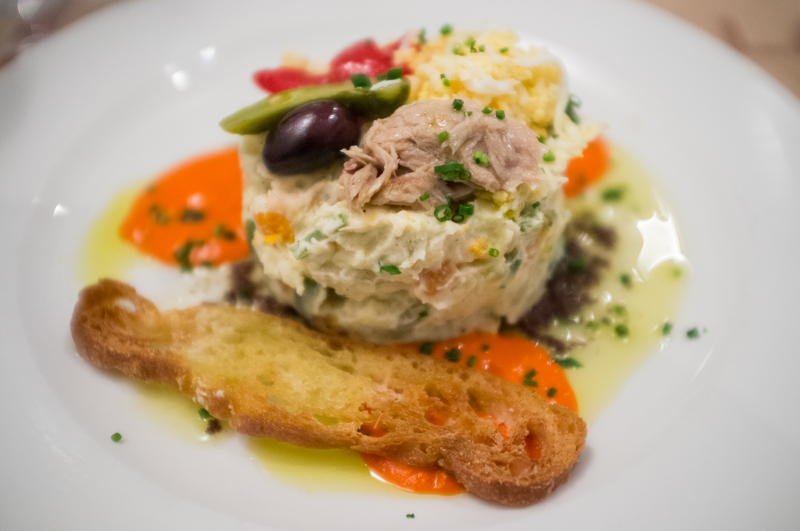 The food is fresh, indicative of the Catalan cuisine and the place is filled with happy locals having long lunches. In fact, one fellow diner asked us where we were from and wondered aloud how we knew about the restaurant (it was on our hosts’ recommended list). We dined there twice and each time the menu was different and each meal was superb. 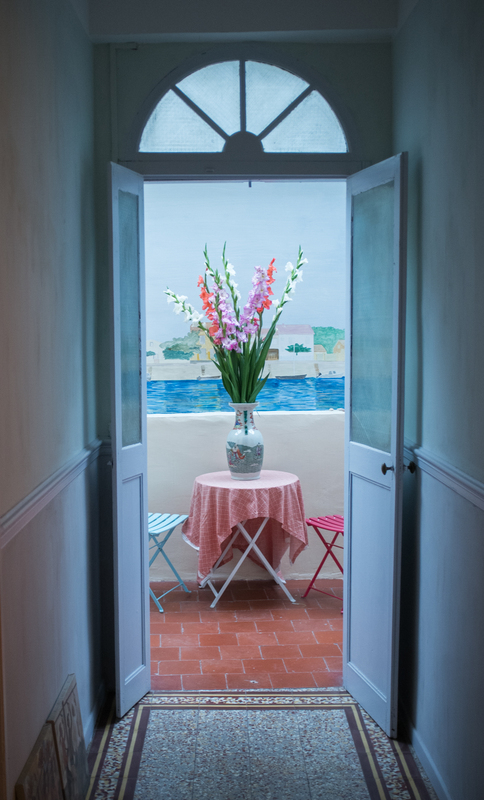 Plan on savoring your meal and having a lovely siesta. 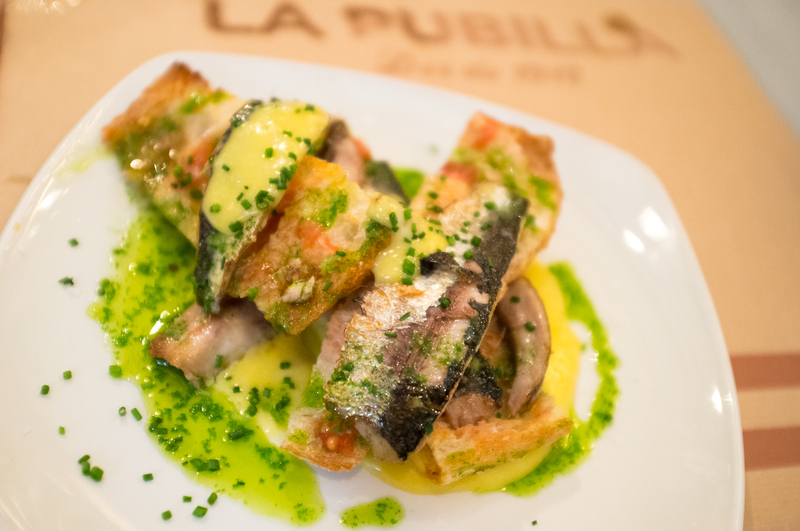 One of the daily specials at La Pubilla in the Grácia neighborhood. More tasty treats at La Publilla in Barcelona’s Grácia neighborhood. As you know, people in Spain eat their evening meal quite late compared to American schedules. 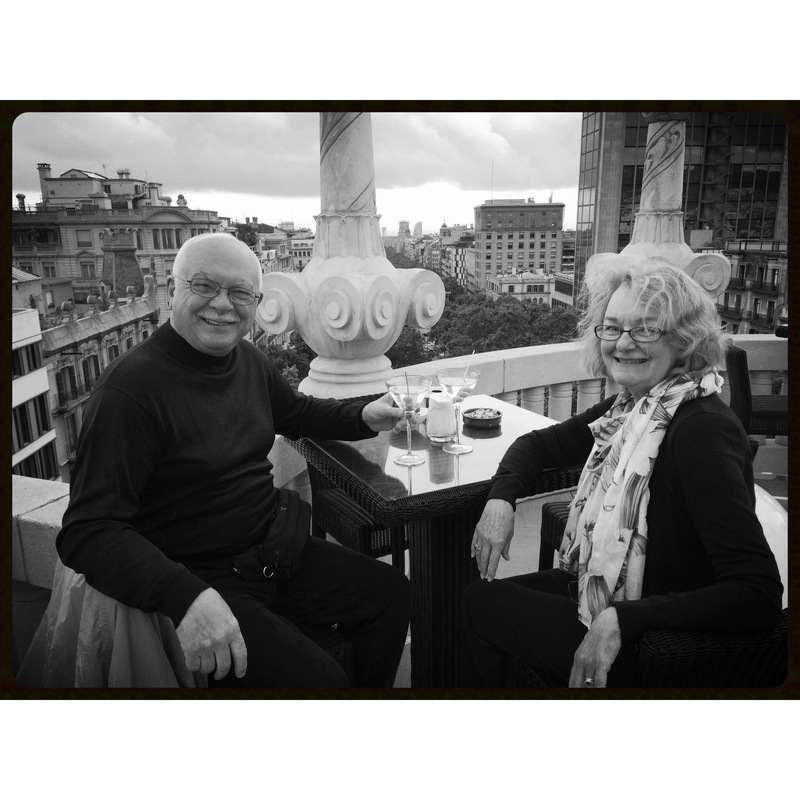 We think that’s why they built the rooftop bar at the Casa Fuster, so we could ease into the contemplation of dinner with a pair of finely made dry martinis and a spectacular view of Barcelona. 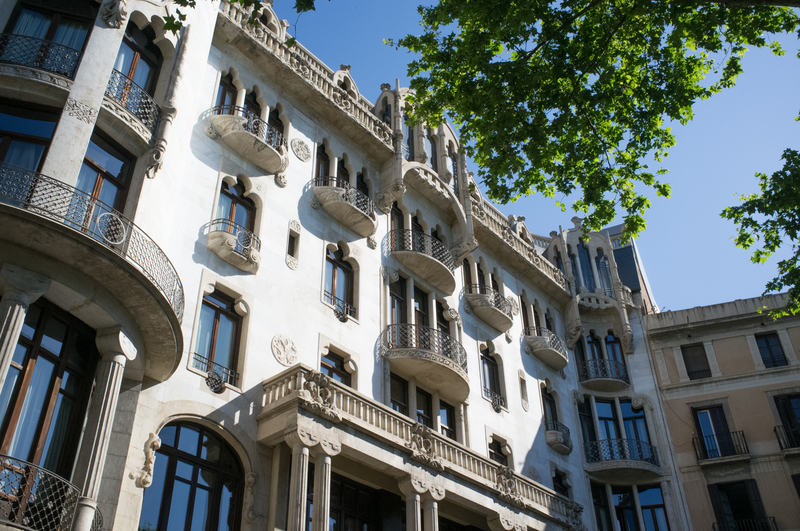 A gem of a hotel designed by Catalan architect Lluís Dominic i Montaner (more on him later), we promise that this splurge on a couple of cocktails will be a delight. Time your visit for “the magic hour” when the sun gets low and, while there doesn’t seem to be a dress code, one feels more comfortable in “going out to dinner” attire. That “travel sport coat” and chic “black jacket” can work wonders. 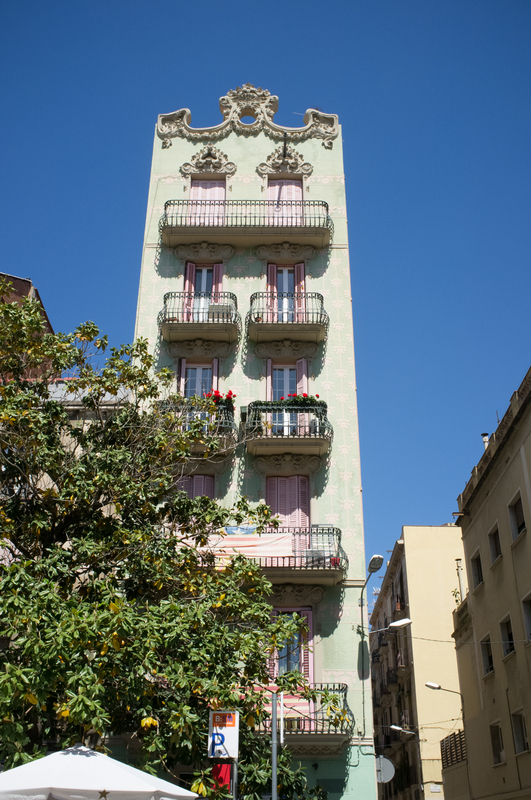 Exterior of Casa Fuster Hotel in Barcelona. Martinis at Casa Fuster’s rooftop bar, with views over Barcelona. Not far from Casa Fuster is the Plaça de la Vila de Grácia with its elegant clock tower, still ringing after all these years. On Carrer de Sant Doménec, one block from the Plaça, is Cafe Godot, which we found to be dependable and very friendly, with a good wine list (the wines of Catalunya are delicious – look for the Priorat label on the bottle). We dined there on several evenings during our visit and can easily recommend it. 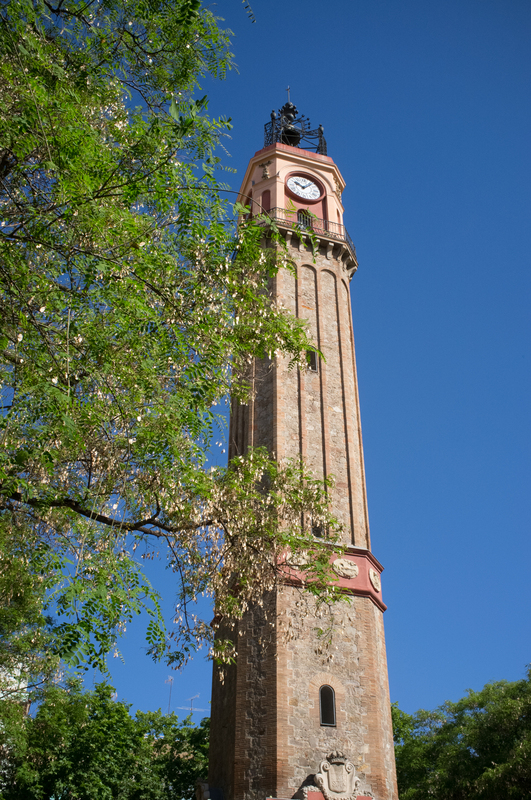 Clocktower in Plaça de Vila Grácia. Nearby is Cafe Godot. 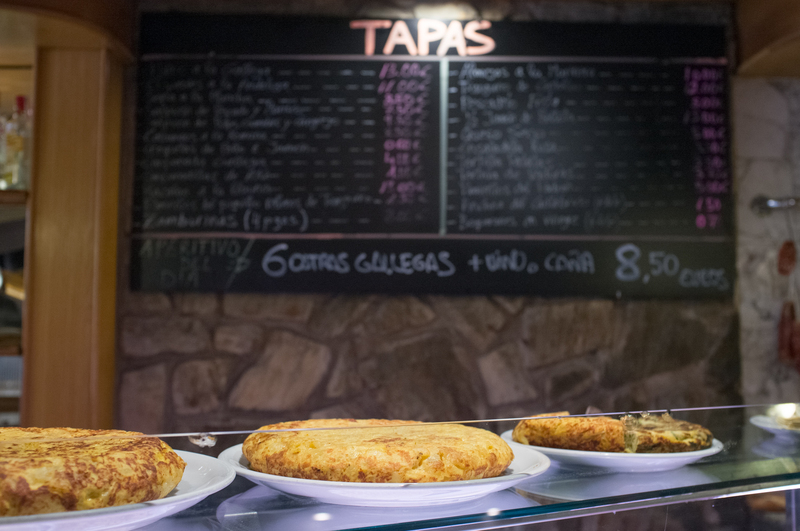 Another choice, with an authentic Catalan menu is Envalira, in the Plaça del Sol, also in the Grácia neighborhood. Their Paella is delicious. 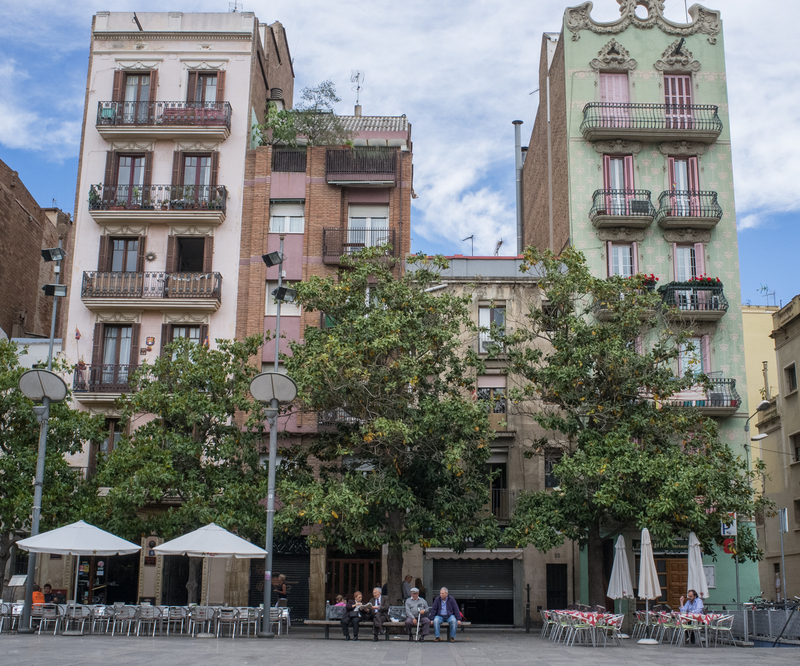 Barcelona seems to us a well-planned city, especially considering its complicated history, and, like many European cities, open space and parks are given priorities. This lovely building houses Envalira restaurant. Delicious Paella. Park Guell, designed by Antoni Gaudi is the famed architect’s idea of a whimsical place for people to stroll with clever winding paths and the expected Gaudi grace notes of color and tile. The granddaddy of Barcelona parks is Parc de Collserola, which, at nearly 20,000 acres, sits like a mantle along the tops of the hills surrounding the city. Sometimes referred to as “the lungs of Barcelona” its abundant green forests support habitats for an enormous number of species of plants and animals. It is easily accessible by the Metro lines. Hikers will love this park. For another day’s worth of sights and sites, try this plan. Start early at the Palau de la Música Catalana. This historic hall of music really speaks for the heart and soul of Barcelona. Designed by the aforementioned architect Montaner, the art nouveau theme pervades the entire building and the magnificent stained glass dome is breathtaking. Try to attend a performance in the main hall as its acoustics are praised by performers from all over the world. Guided tours provide some insight into how the Palau got built. Quite a story. Palau de la Música de Catalana. 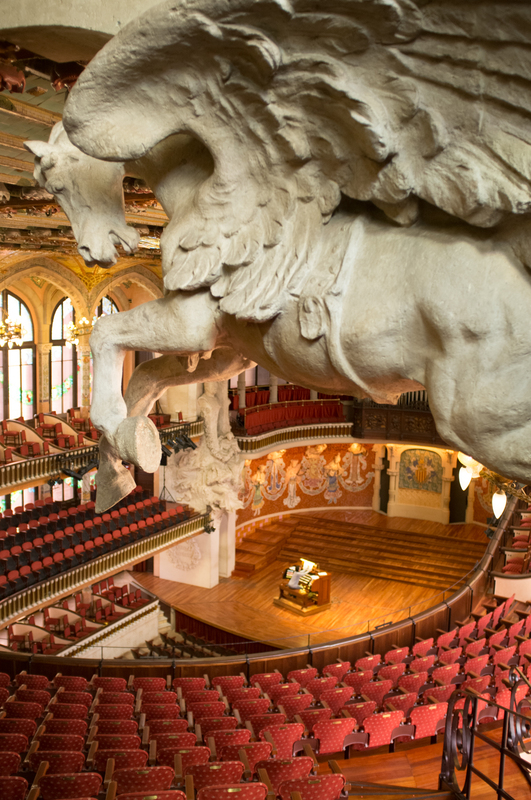 Organist rehearsing in the Palau de la Música de Catalana. 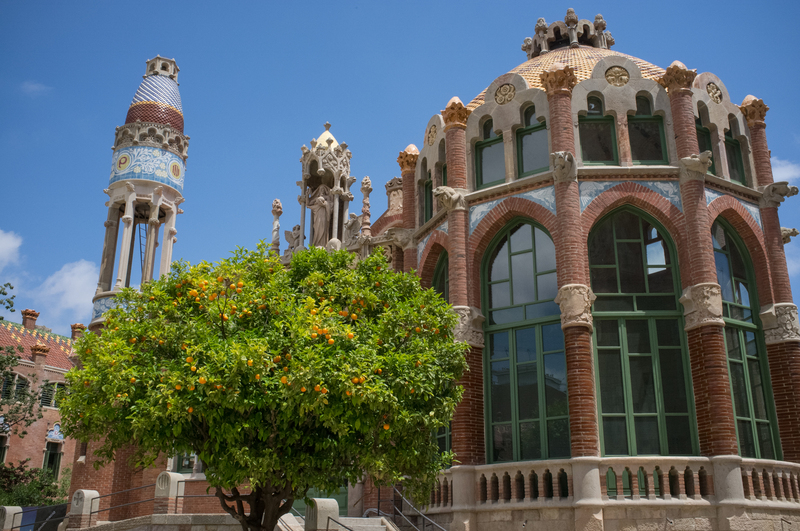 And, sticking with Montaner, next try to visit the Hospital de Sant Pau, recently opened to the public and another one of Barcelona’s World Heritage sites. It was built between 1901 and 1930 and wandering the gardens and among the modernist buildings is an experience. Hospital de Sant Pau, by the architect Montaner. 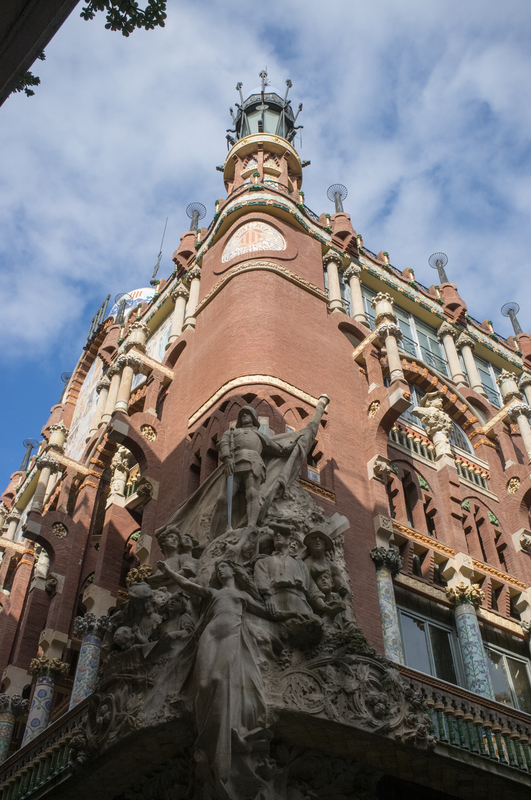 Hospital de Sant Pau, a World Heritage site. 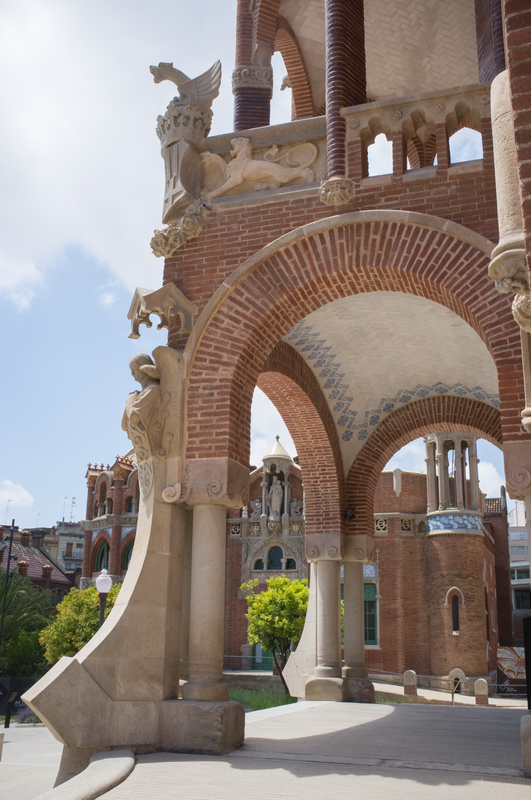 From the front gates of the Hospital de Sant Pau you can look down the Avenida de Gaudi and see the towers of La Sagrada Famila, Antoni Gaudi’s famous unfinished church. Begun in the 1880’s, it “might” be completed, we’re told, by 2026. We’ll see, or maybe our grandchildren will. Nonetheless, even if you don’t want to brave the lines, be sure to at least walk completely around the church to appreciate the magnitude of it. Inside, of course, is amazing and the entrance lines do move right along and are well-managed by staff. 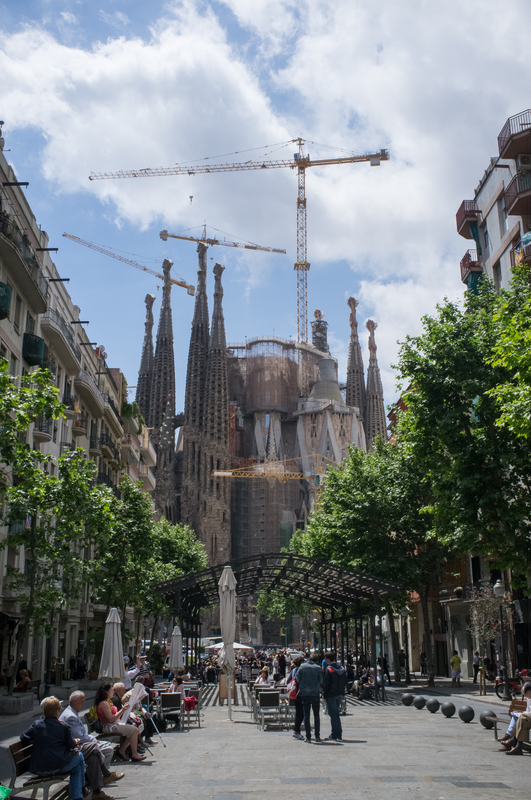 famous church, still under construction in Barcelona. Finally, we enjoyed the great, free, evening show of the Magic Mountain of Montjuïc, dating from 1929, which goes on nightly in the fountains in front of the National Museum of Art of Catalunya. It is a colorful, lovely show with music, light and water. 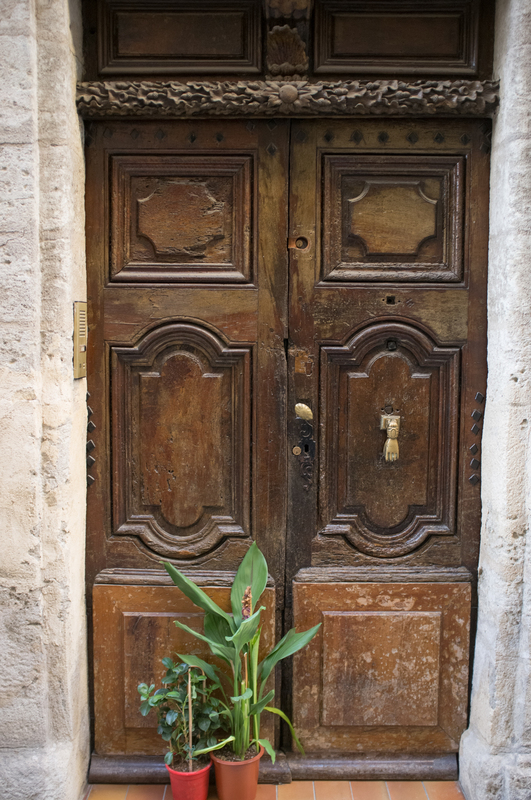 So…adios, Barcelona and bonjour France! Thanks to some superb work on the part of Rail Europe, we obtained reservations on the new TGV line from Barcelona over to Beziers, cutting the travel time in half, to about 2 hours. You can still take the “local” train which goes via a more coastal route but we wanted to experience the new line and Rail Europe’s reservations system is great, withour seats right where they said they would be. Lézignan-La-Cebe is a small village but beautifully situated in vineyards. Vineyards near Lézignan-La-Cebe in the Languedoc region of Southern France. 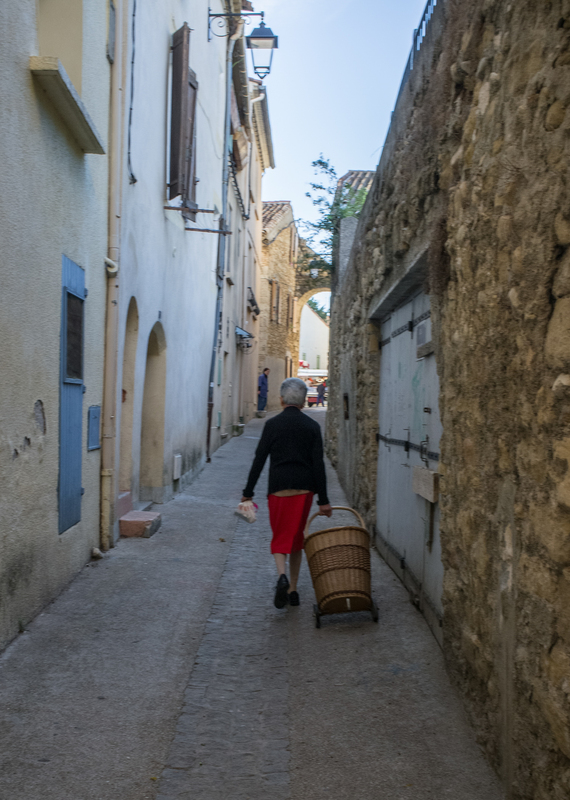 Our friends Jean-Pierre and Meredith picked us up at Beziers, in the heart of the Languedoc wine region and hosted us for several days in their small village of Lézignan-La-Cebe. 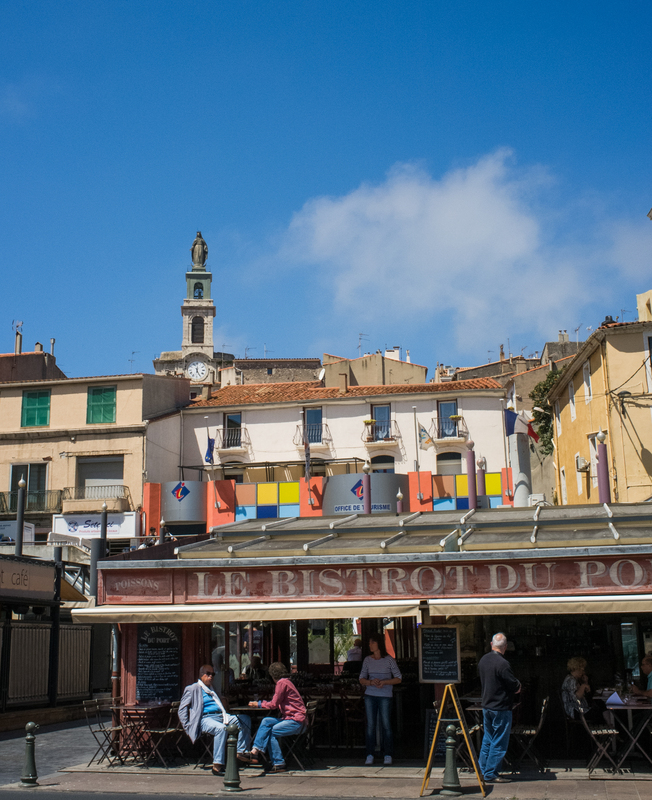 This is an area of southern France where you can go to a different market in a different town every day. Where you can go for 10 minutes on a Plane treelined road to a “certain” butcher or small farm and get just the right cut of pork or a chicken, knowing just how it was raised. And that wonderful woman in Pézanas, just up the road, who buys her fish right off the boat in Séte in the dark hours before dawn, and the croissants at the adjacent bakery and across the street at the coffee store where a complimentary cup is always offered. 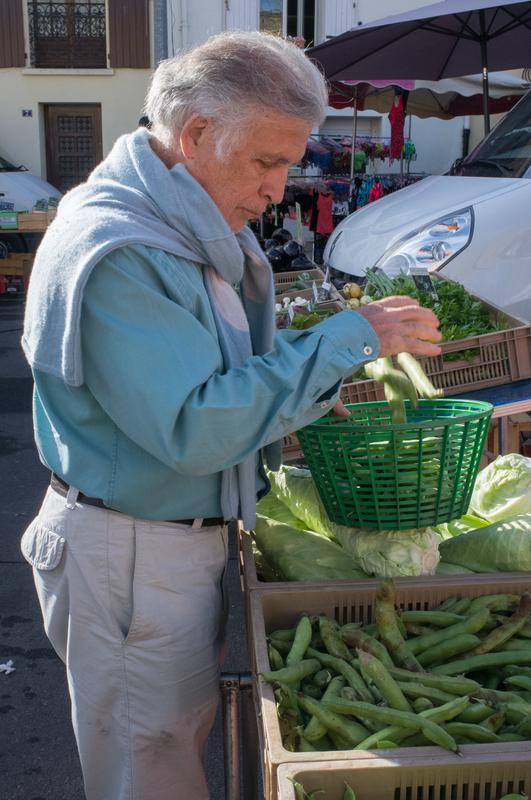 And, of course, the organic fava beans and other produce lovingly tendered for sale nearby in the town of Gignac. You get the picture. 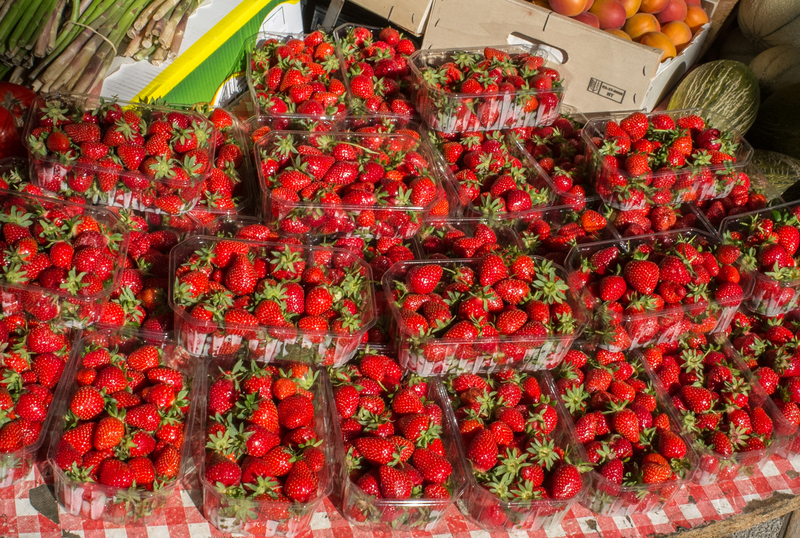 Fresh strawberries in the village Gignac. 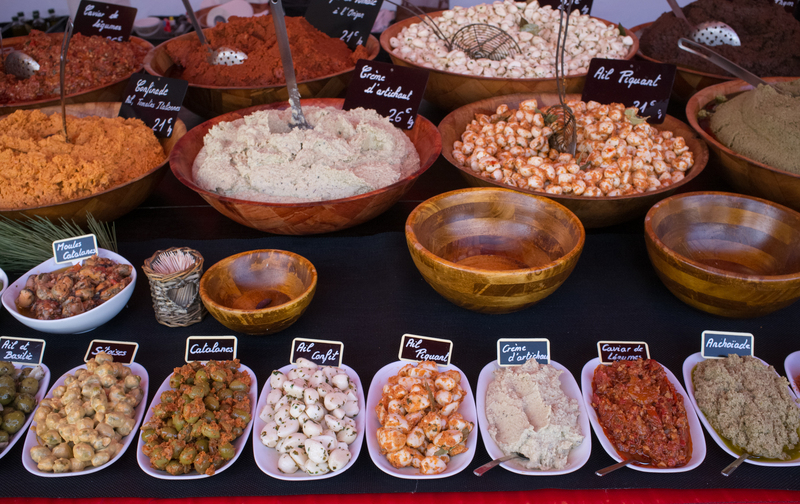 Varieties of just about everything are found in the daily markets in the villages of the Languedoc. On the way to market. 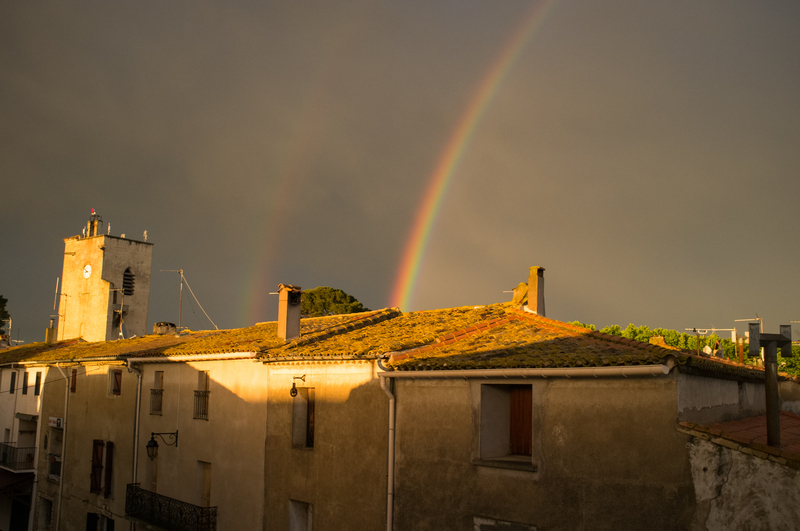 Every time we go to southern France, we want to live there. Jean-Pierre, a native of Bordeaux, is an knowledgable, and suitably perfectionist, chef whose love of traditional French cooking is a great benefit to his friends. His epic cookbook, “Still Cooking After All These Years” occupies a very honored place in our kitchen and he’s even made it available to the world, for free, on a blog (link below) of the same name . Going to market with him is an educational experience and fun. Shopping with Jean-Pierre is an adventure and an education. Be sure to click the link to his cookbook at the bottom of this post. Great reading and he generously shares his recipes and cooking philosophies with the world. Our hosts took us to Séte, where commercial fishing vessels come and go from the blue Mediterranean and where the famous annual Water Jousting has been celebrated since the mid-1600’s. 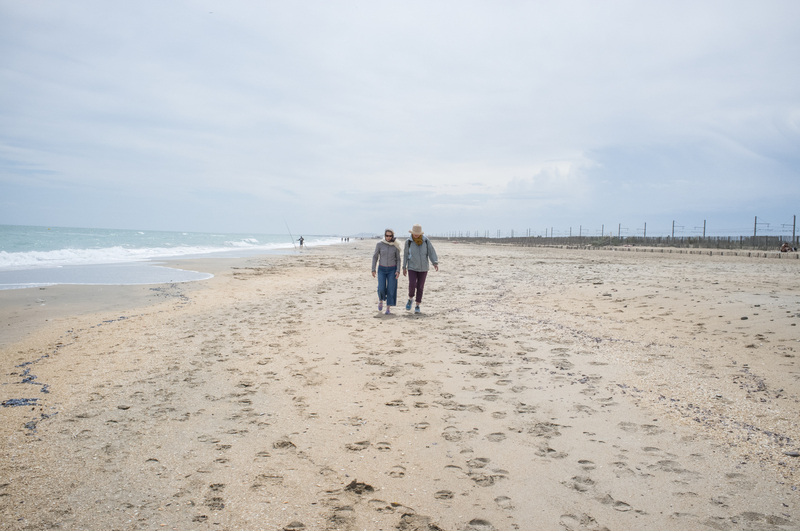 From there we moved along the vast beach to Agde, noting the huge oyster beds in the lagoon between the cities and the breeze off the Med making the day a delight. 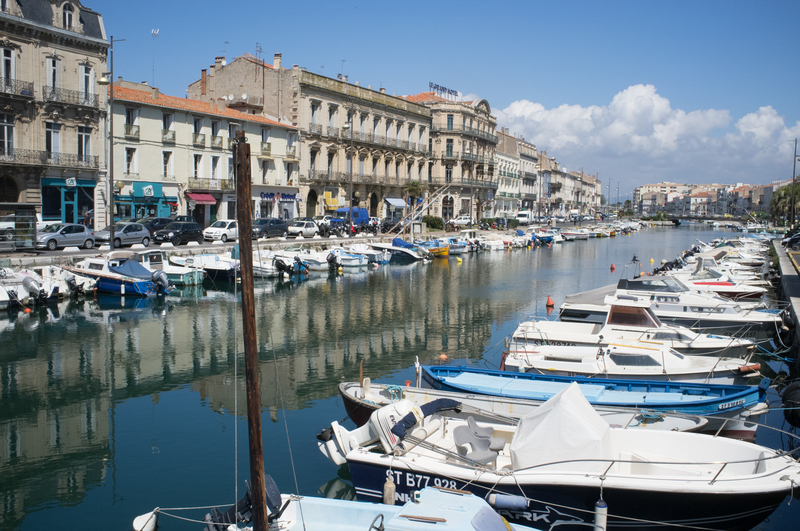 A relaxed pace in Sete, but the town really comes alive during the water jousting tournaments each summer. Beautiful, serene Sete, near Beziers in Southern France. The wonderful long beach at Agde. 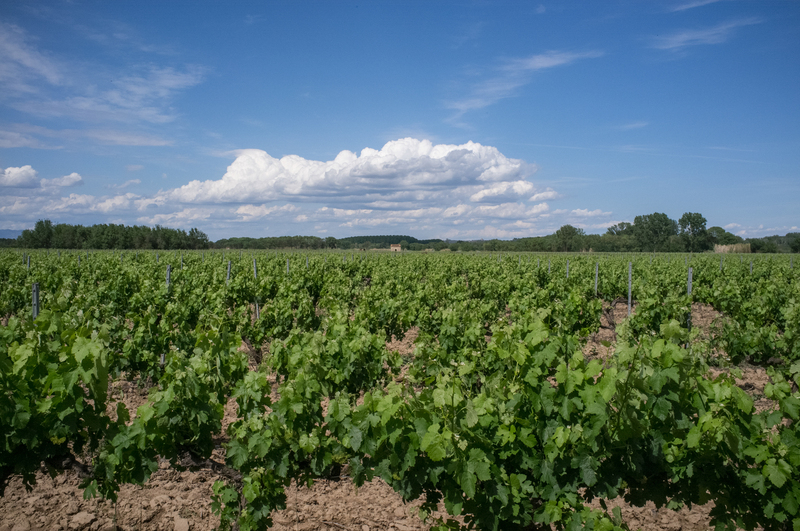 Wineries and wine cooperatives abound in the Languedoc. There are so many intricacies to French history and the economic relationships between the regions, departments and the central government that it makes a fascinating study. Just the origins of the wine cooperatives is worth looking into. When you are here, stop at some wineries and taste. The wine is good and the vintners are charismatic. Inside a lovely home in Lézignan-La-Cebe. 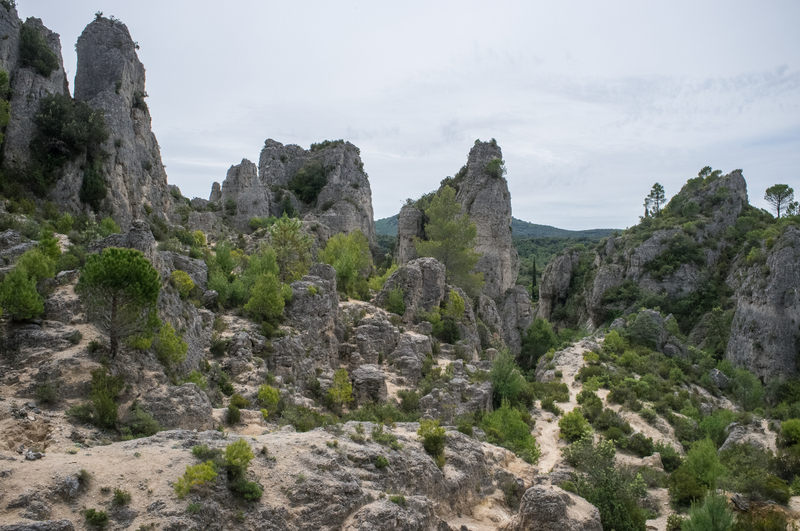 Two towns in the region we especially liked were tiny Mouréze, with its unique rock formations and hardy hiking trails up to excellent viewpoints. This is a quiet village and very picturesque. We also enjoyed visiting nearby Salasc, a charming small town, minutes from Mouréze, that makes you dream of a life in the beautiful hills there. And so to our land-rocket trip to Amsterdam. Again praising the work of Rail Europe, our TGV seats from Béziers to Paris were just as advertised and the train clean and comfortable. There are slower trains across Europe, but if you want to get to Paris from southern France in a little over 3 hours, outrunning, we noticed, several small aircraft, then the TGV is your rocket ride. TGV, as most of you know, stands for Train á Grande Vitesse and generally cruises around 200 mph between cities. Zoom. Into Paris’ Gare de Lyon, taxi to Gare du Nord for our Thalys high-speed train to Amsterdam. Fields of flowers race by in Flanders and we stop for a moment in Brussels, no time for chocolate, and off again for Amsterdam. We’ll return to Paris another time. We always do. 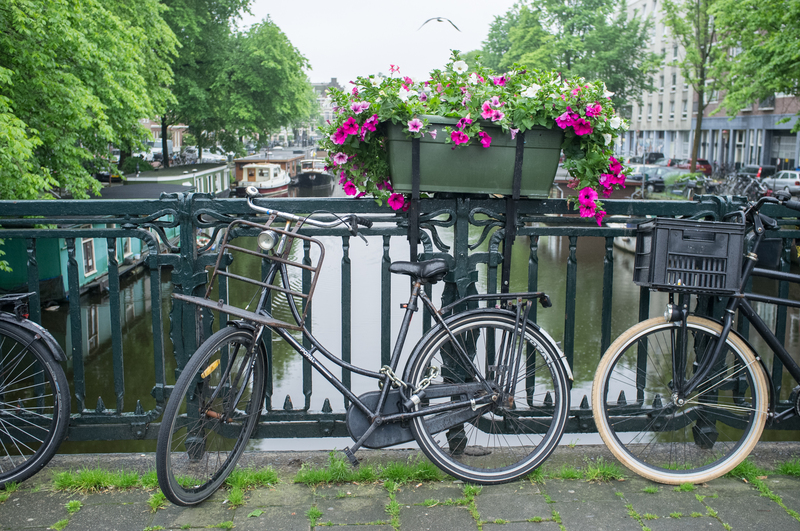 Bicycles, canals, and flowers are signatures of Amsterdam. Ah. The canals in Amsterdam. Couples, hand-in-hand, kissing as they cross on a canal bridge. An easy tradition to love. Holland is a charming country full of gracious, direct and humorous people. Most speak English, sometimes better than we do. We adore them. 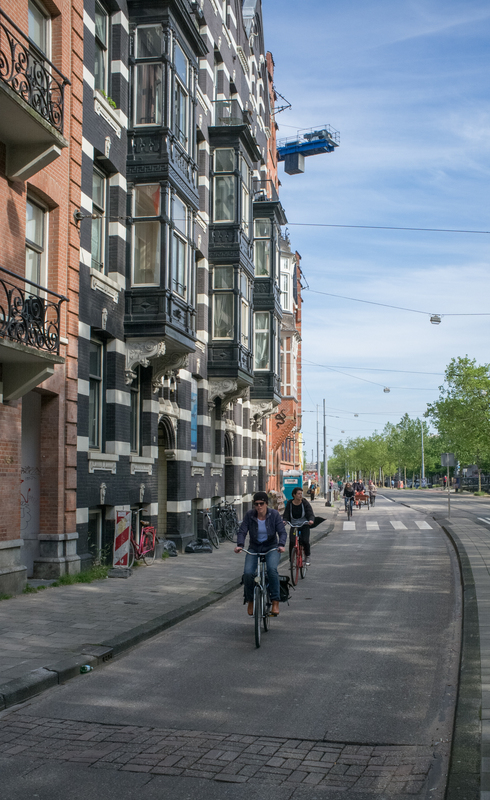 We arranged our Amsterdam stay, as we did in Barcelona, through VRBO, and found ourselves in a one-floor-up apartment owned by our host André, in the newly fashionable Oud-West neighborhood, easily accessed by tram from Central Station. Settling-in and taking a breather from our marathon train ride from southern France, we set forth the next day to obtain iAmsterdam cards from the Tourist Office across the street from Central Station. This office has all the brochures and maps you can imagine and the staff is multi-lingual, friendly and informed. The 72-hour iAmsterdam card really worked for us during our stay. It provides you with unlimited bus and tram travel and mostly free or meaningfully discounted entrance to most museums, and there are plenty of those. 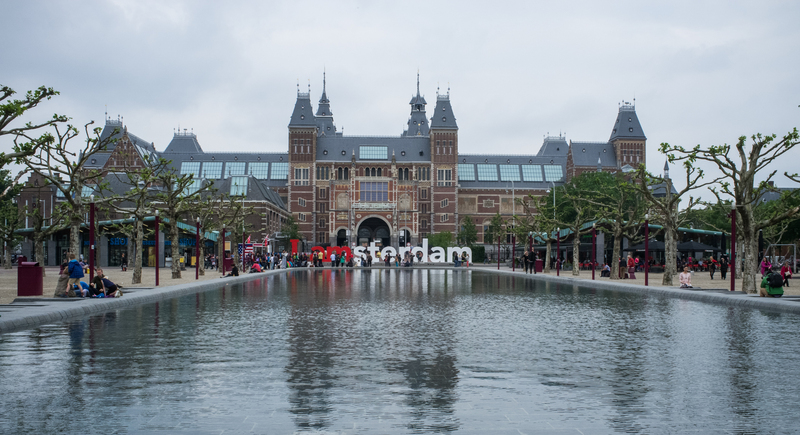 The Rijksmuseum and reflecting pool in Amsterdam. Our first museum was the Van Gogh Museum in the broad, clean Museumplein, also home to the newly-renovated Rijksmuseum (the National Museum of the Netherlands) and the Stedelijk Museum, which houses a large collection of modern art and design. Don’t miss “The Beanery” in the Stedelijk. In the Van Gogh Museum you will find other artists’ work on exhibit and an extensive collection by Van Gogh, of course. The Rijksmuseum houses a very good range of Dutch masters including Rembrandt’s famous “Nightwatch.” The scale of some of these paintings is tremendous, like many of those in The Louvre in Paris. Have a seat, wait until the crowds thin for a moment and regard the magnificent detail and expressions in these true works of art. Lunch in the Stedelijk’s great restaurant is recommended. We noticed locals having business lunches there as well as our fellow museum-goers. Rembrandt House on Jodenbreestraat near Nieumarkt is also a great visit and free with the iAmsterdam card. Bikes, bikes, bikes. Mind the bikes in Amsterdam. 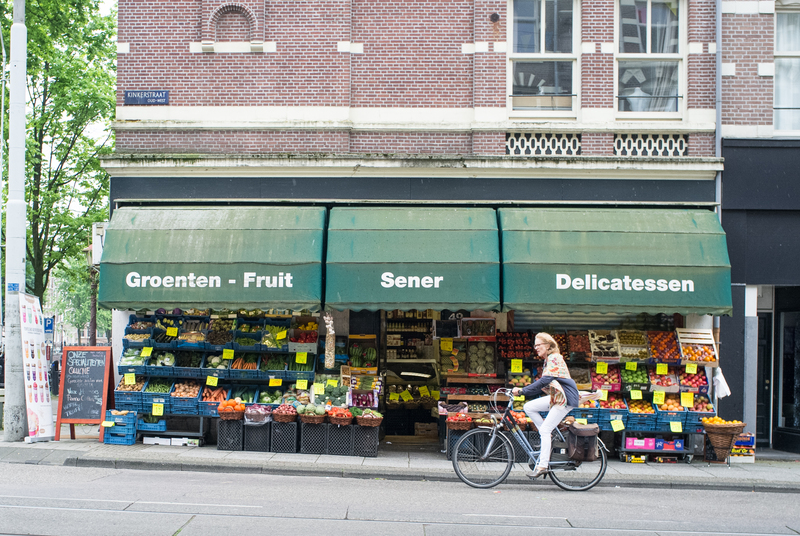 According to recent figures there are about 811,000 people in Amsterdam and 881,000 bicycles. In other words, “mind the bikes” should be on the tip of your minds when walking on the sidewalk. There are bike lanes separating pedestrian traffic from auto traffic. This means you cross a bike lane before you cross a street. Both directions. Bikes rule in Amsterdam and give it much of its character as do the canals. As in other cities, bikers texting and talking while riding in not uncommon. Mind the bikes! 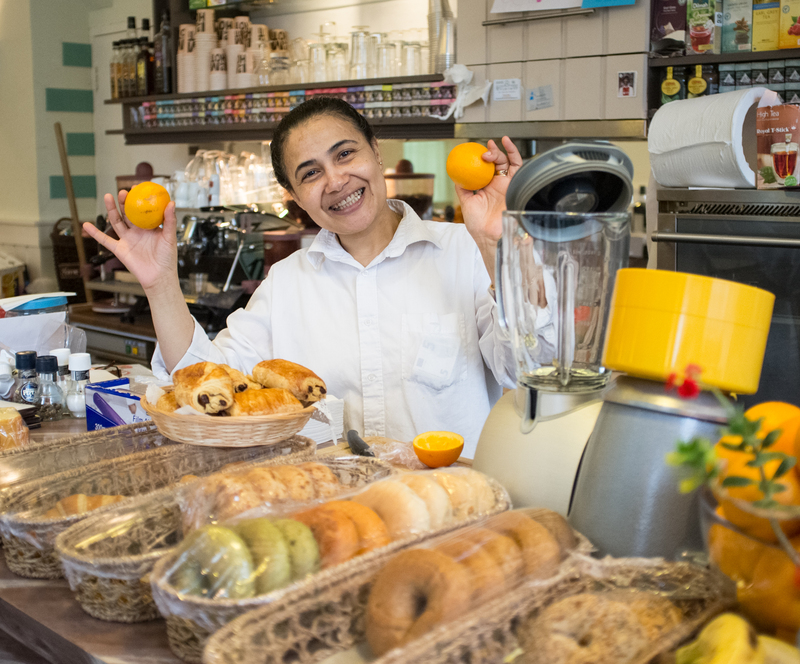 The delightful Egyptian patroness with Moroccan oranges in our Amsterdam Oud-West neighborhood. As always in Europe, cafes and restaurants can occupy much of one’s time. Amsterdam is no exception. The stoner “coffee shops” are still around and “head shops” can still be found, but not like in decades past. In fact, the Dutch government has recently discouraged that component of tourism. But cafes and restaurants not offering zee hemp are ubiquitous. We love Café de Jaren on Nieuwe Doelenstraat, with its unique location at a busy canal intersection. Grab a table outside and watch the parade of boats back and forth. The food is good and the staff is very friendly. Canal side at Cafe de Jaron, Amsterdam. The small but worth-the-wait-make-reservations Foodism, on Nassaukade, is simply remarkable for what they can put out in a small kitchen. While it was the hot pick during our visit, it is not overrated. The Bosnian staff knows what they are doing and, for exceptional food with good portions, prices are reasonable, including their wine list. 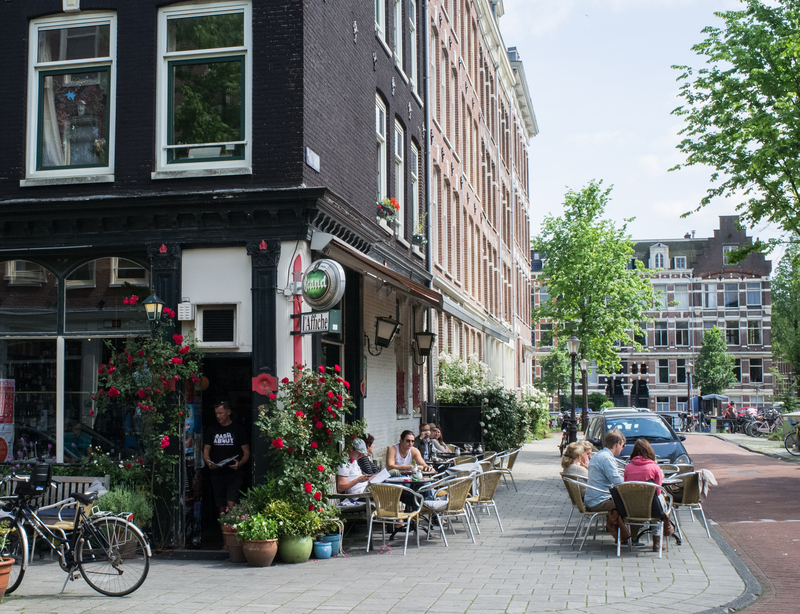 And two dependable and reasonable neighborhood restaurants, De Italiaan and Café Toussaint, adjacent to each other on Bosboom Toussaintstraat have our recommendation. Good locals’ hangouts and very friendly. A neighborhood corner bar in Amsterdam. The Anne Frank House is a pilgrimage for many. It is a touchstone for events in modern history which shape our world today. Anne Frank’s story, based on her Diary, is a story of hope and belief that goodness will prevail. For countless reasons, a visit to the house is time well-spent. Some improvements in accessibility have been made since our last visit many years ago but the house remains essentially as Anne Frank experienced it, with the nearby church bells she wrote about still audible in her family’s hiding place. Advance tickets are recommended. Canal boat living in Amsterdam has been the dream of many. 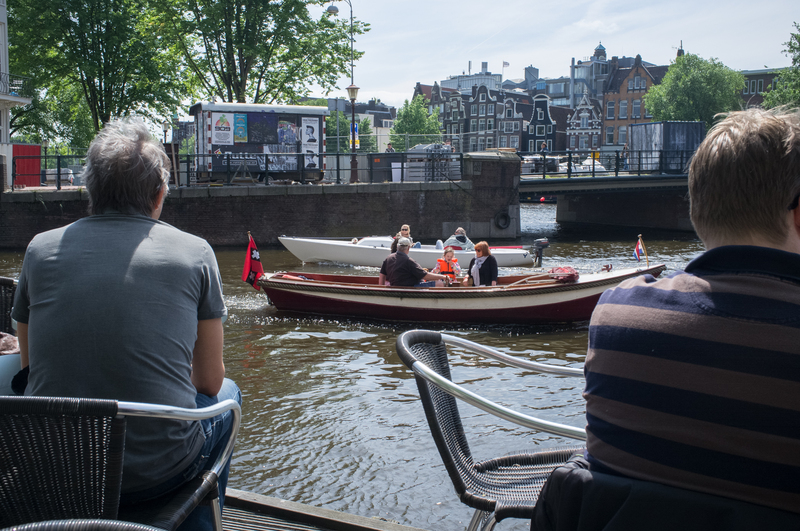 Your iAmsterdam card also gives you free boat tours on either the Blue Boat Company (departing near Museumplein) or the Holland International Canal Cruises (departing near Central Station). 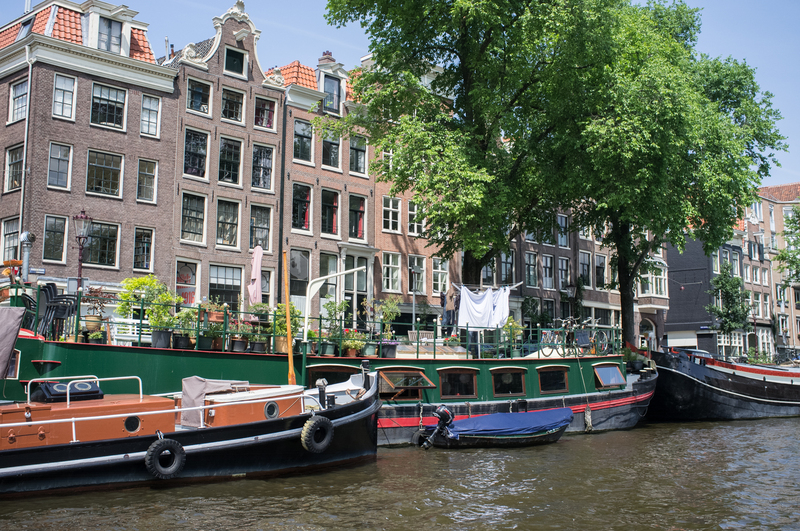 These tours, in boats with glass tops, give you a great sense of Amsterdam’s canals and how the Dutch figured out how to manage the sea and build a city. The boat skippers are an interesting bunch, too, dealing with amateur boaters in the canals as well as informing their passengers of sights passing by. So that’s our report for this post….Bon Voyage!! !